April 12: limited Tables Available! 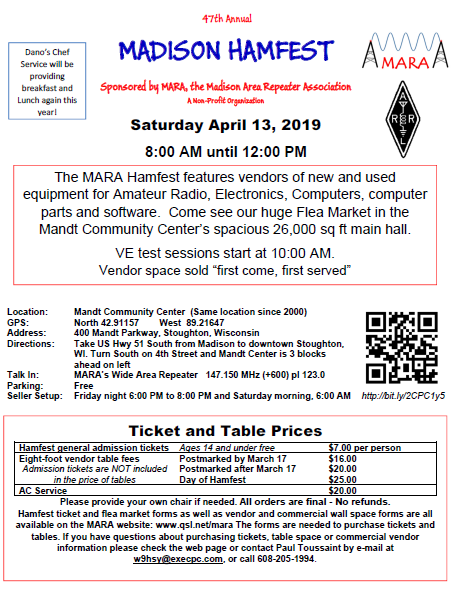 The MARA 2019 Hamfest will be held on Saturday, April 13, 2019 at the Mandt Center in Stoughton, WI. Doors open at 8:00AM. This will be THE social event of the year! Hope to see you all at this years Hamfest! We have Dano’s Chef Service on deck to run the kitchen and sell us breakfast and lunch as well. Last year his food got great reviews. We are lining up some classes on some of the newer technology that we support, we’ll keep you informed here. IN PERSON ORDERING TONIGHT AND TOMORROW MORNING ONLY! Click here to sign up for our MARA Newsletter.